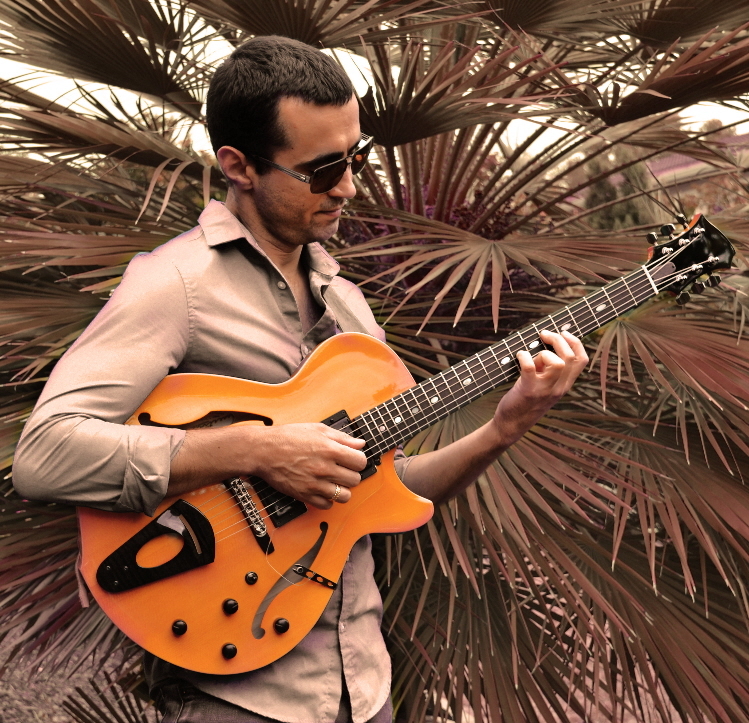 Hristo Vitchev is a Bulgarian-born and San Francisco-based contemporary jazz guitarist with a series of albums out on indie label First Orbit Sounds. 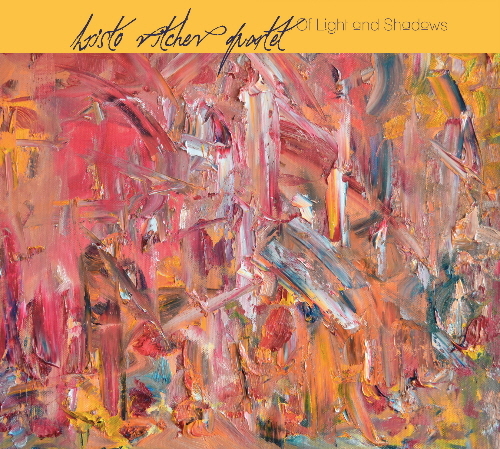 His latest release, Of Light and Shadows, continues a string of progressive impressionistic albums he’s recorded with his steady unit of Jasnam Daya Singh on piano, Dan Robbins on bass and Mike Shannon on drums. It may be a cliché to say that an artist’s latest release is their best, but it takes a while to truly gel and operate on all cylinders as a group. And, with this latest endeavor, that is indeed the case. The cover art for this latest album — as with most of Vitchev’s previous recordings — was painted by the leader himself. It is certainly an abstract blend of light and dark colors, hues, brushstrokes and shades, that tie perfectly with the album title. “Of Light and Shadows” is the first track that sets the pace for the album. And, like the cover, is multi-tiered and complex. The tune seems to be broken down in sections, with a light samba-like feel supporting the main theme. The mid-section establishes itself as a vehicle for the drums and piano to step out. The piece is very open and has a kind of baroque ECM label element to it. Some of Pat Metheny or John Abercrombie’s early work comes to mind. “The Shortest Wavelength” follows with a thoughtful piano intro by Singh that leads into something, I believe, in 7. As with the ebb and flow of a traditional waveform, the piece slowly builds in intensity and subsides as drummer Shannon and bassist Robbins ride the tide. “Selective Absorption” features a soft and lilting melody that wafts above the rhythmic fray. The dialogue and transitions between Vitchev and Singh are extremely focused and smooth. The head of the tune is as tuneful as it is challenging and Shannon’s rubato figures at the end provide excitement and flair. After the somewhat up tempo arc of the previous tune they take it down a bit for kind of a romantic piece called “At Your Side.” There are some lovely peaks and valleys here where Vitchev demonstrates his strengths as both composer and soloist. Shannon’s artful brush work in tandem with Robbin’s warm and resonant bass is transcendent. “Prelude to Prismic Dance” is a tasteful intro piece featuring Singh’s graceful and lush solo piano. His use of triads and trills really builds things up and leads into “Prismic Dance.” Vitchev’s glossy chord textures and seemingly effortless solos glide nicely over odd time signatures and well-orchestrated dynamics. The colorfully titled “Pentachromatic Butterflies” is a melodic piece that blends with a slightly dissonant or minor edge. It is very modal and open, with some fluid solos from Robbins. Also, this tune features a nice use of time and space. Vitchev isn’t really about chops as much as giving his solos a chance to breathe and develop with each pass. The other overt ballad here is “ A Portrait of a Love Forgotten.” This is a pensive and somewhat somber tune that is sweetly lyrical and a nice showcase for the band. Vitchev plays a very linear, yet abstract melody, with a tone and approach that recalls greats like Lee Ritenour, Steve Khan or George Benson. Singh’s Bill Evans-like piano and Shannon’s Joe Morello-styled brush work make this one a highlight. The album concludes with the noir-ish coined “Partial Darkness.” There is a lot going on here rhythmically. The drums kick things off in a very vibrant and flashy manner. Singh shifts into some dense and reflective passages as Vitchev holds the weight of the melody with a somewhat funky repetitive figure. There is a nice breakdown of the drums and bass in the middle and the structure offers the listener some interesting twists and turns. 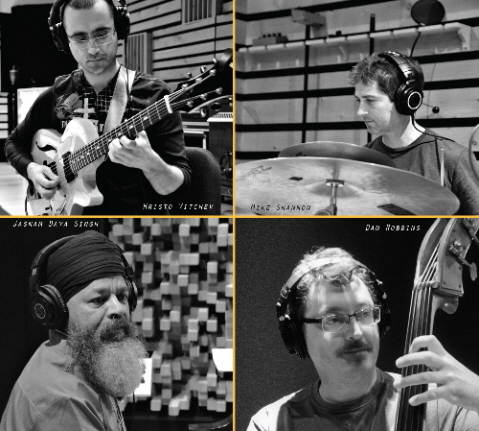 The Hristo Vitchev Quartet is truly setting the scene for cutting edge jazz on a global scale. Pick up this current snapshot of their visionary music and you will not be disappointed. The “Itinerary” page of Hristo’s website lists three upcoming performances. Tonight, Saturday, February 3rd, as part of the Pat Bianchi Trio (Pat Bianchi, Hristo Vitchev, Sanah Kadoura), Hristo plays Cafe Stritch in San Jose, CA. On Wednesday, February 7th, the Hristo Vitchev 3 (Hristo, Pat Bianchi, and Sanah Kadoura) perform at Cafe Pink House in Saratoga, CA. And on Thursday, February 22nd, Hristo is back at Cafe Stritch as part of the SJZ Collective (Brian Ho, Oscar Pangilinan, Saúl Sierra, Wally Schnalle, John Worley, Jr., and Hristo) for “SJZ Collective Reimagines Monk.” Be sure to check Hristo’s website for future gigs as they’re added. This entry was posted in Album Reviews and tagged Album Review, Eric Harabadian, Hristo Vitchev Quartet. Bookmark the permalink.